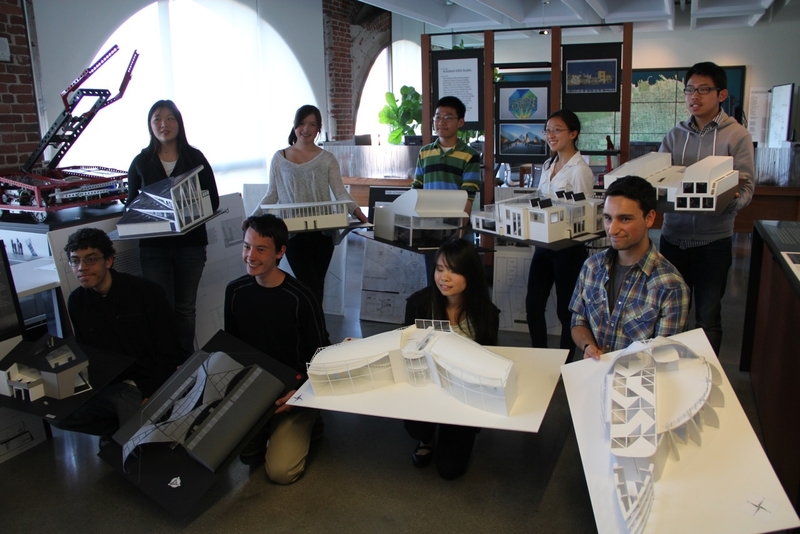 Completing phase one, the winners were selected last Sunday in the 42nd annual high school design competition of the Architectural Foundation of San Francisco. Friendly reminder: The challenge was to imagine a student pavilion for the 2013 America’s Cup Village. Let’s tip our hat to the two schools who each had two winners, Lowell and the Academy of Arts and Sciences. Overall winner for design was Lowell’s Cole Skaggs. 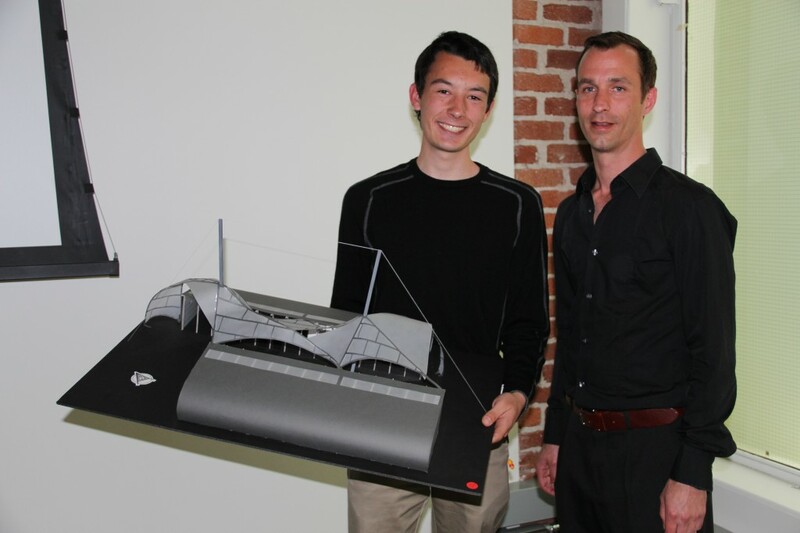 Also from Lowell was graphics design winner Sean Gowin, while the Academy’s Mohammed Eid was awarded for best model, with Erina Yamada leading the entries for a presentation using Autodesk Revit software. The America’s Cup Event Authority contributed two judges to the judging panel, including Wesley Wernimont, Head of Design. Wernimont commented, “Leading up to the competition I really didn’t know what to expect, but when I was walking around judging the models and presentations I had to keep reminding myself that high school students created these. They were so well done.” A closer look at the overall winner and his design, with Wernimont . 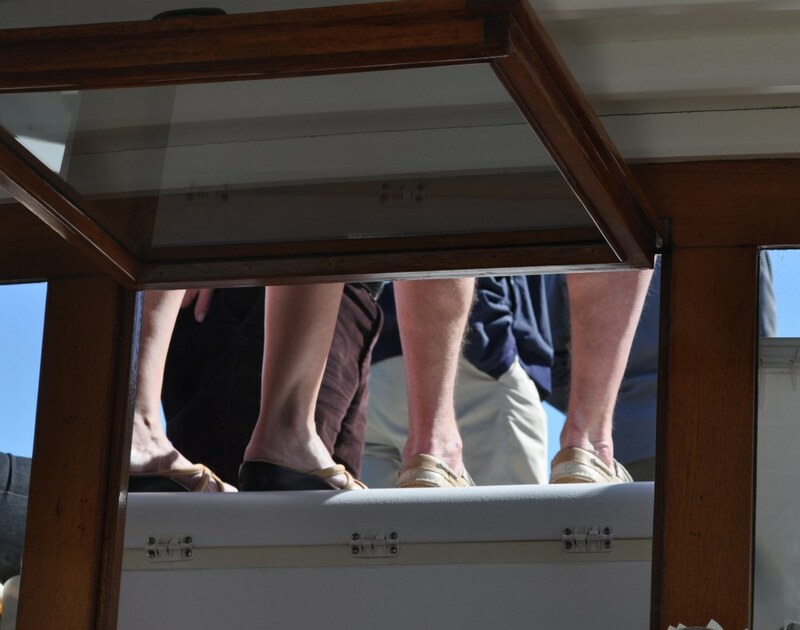 . .
There’s an AFSF awards breakfast coming up, where the winner of the America’s Cup Event Authority’s prizea summer internship with ACEA’s design departmentwill be announced. And we’re working on a sked for that special prize for the four category winners, a ride on America’s Cup Organizing Committee vice chairman Peter Stoneberg’s 40-foot Shadow. 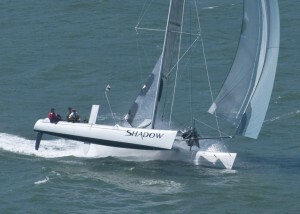 Until the AC boats arrive, it’s the fastest cat on San Francisco Bay. Sunday was Opening Day, not that there’s anything to open, but hey, any excuse for a party. The day came along with headlines reminding us that, in many parts of the world, there is no party, and we here are blessed and must not forget. My ride, in fact, bore its own reminder of the complications of the world. Pat Pending has been in Mel Owen’s family since his father bought the boat in late 1940. 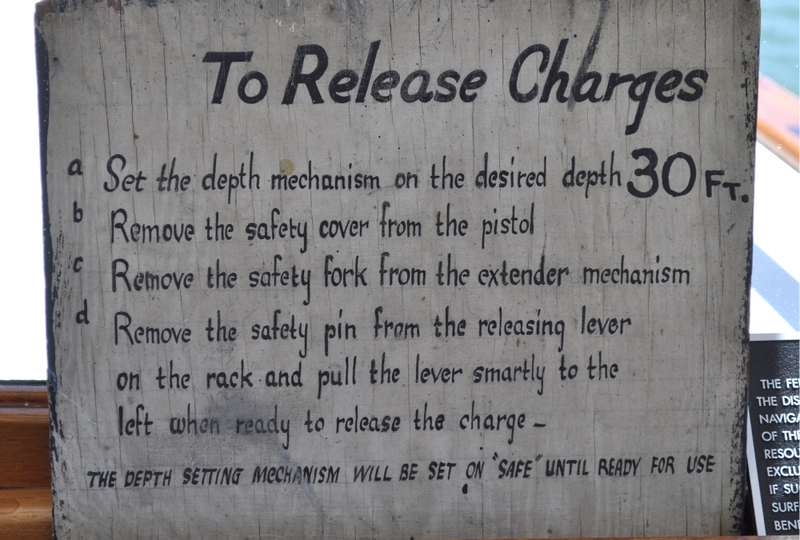 We all know what happened in December of ’41, which explains the plaque that is mounted on a bulkhead . . . 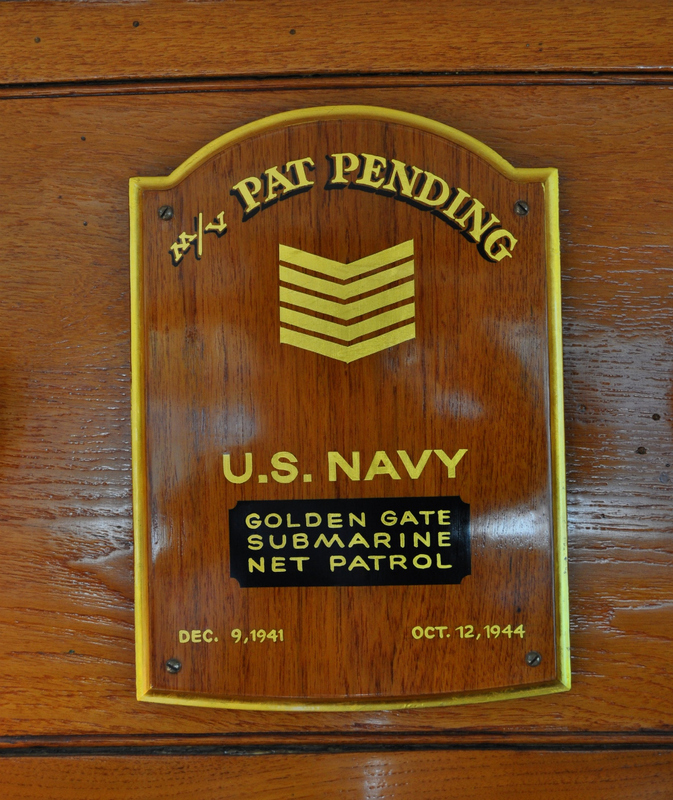 Note that the Navy lost only two days, following Pearl Harbor, before requisitioning Pat Pending for duty patrolling the anti-submarine nets that stretched across the entrance to San Francisco Bay. 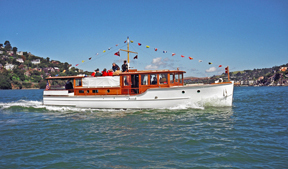 This was the common fate of motoryachts of a certain size, and it was quite a different Pat Pending that Don Owen bought back after the war for a hundred bucks. And then spent $26,000 to restore. And I’m sure of two things: 1) the old girl has sucked down a lot more dollars than that, in the years since; 2) in 1941, the future was a dark abyss, and signs such as this were no joke . . .
Seventy years ago, in the innocent spring of 1941, Pat Pending led the whole Opening Day parade. 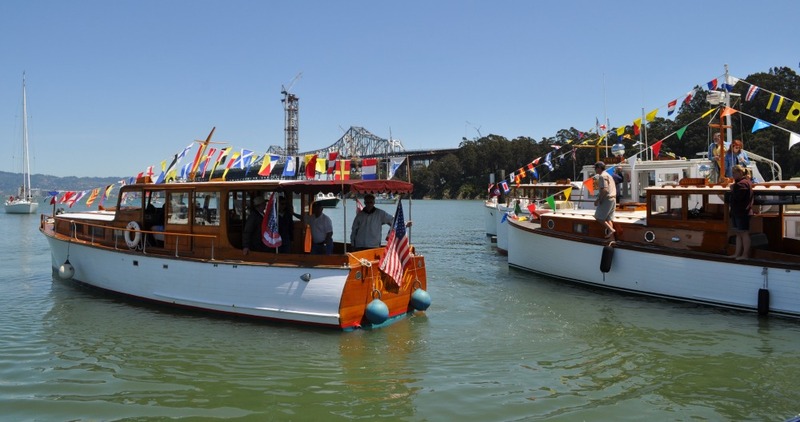 This year she led the Classic Yacht Association segment. The view aft . . . 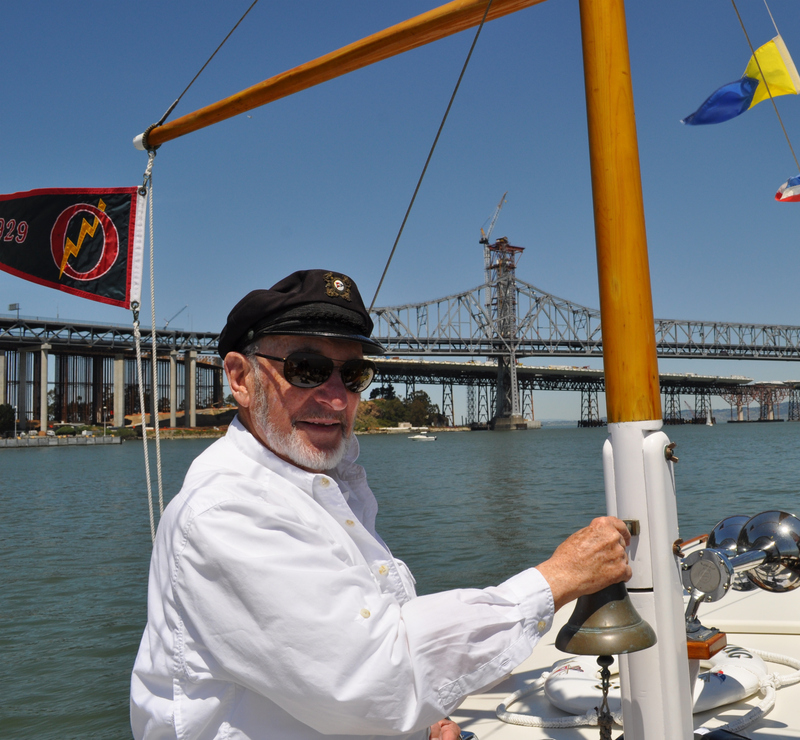 Here is Skipper Mel Owen against a background of work in progress: the old Bay Bridge, east span, and the rising tower of the new and far more aesthetic bridge to be . . . 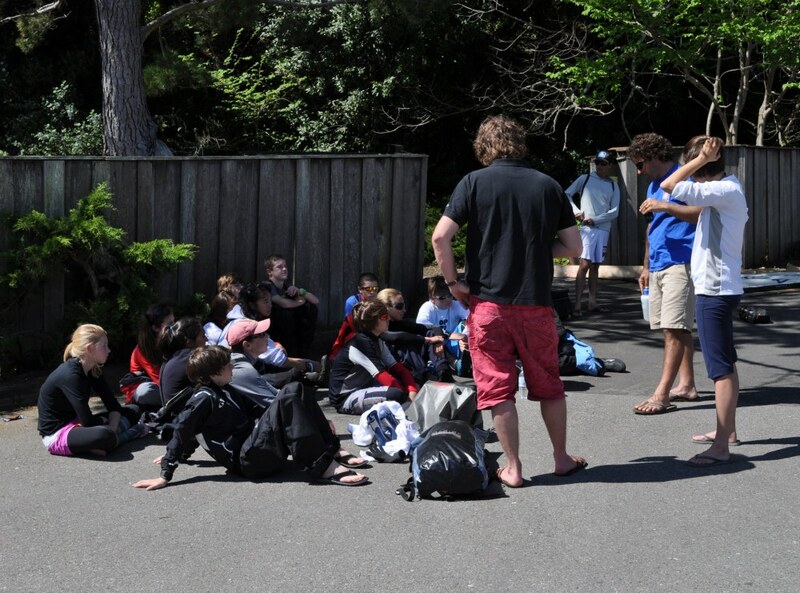 The CYA rallied for lunch at Clipper Cove, Treasure Island. This is Beauty, a 1941 Stephens coming to the dock with the tower beyond. It’s yet another shot that can never be duplicated at any other Opening Day . . . I came away with lots of pretty pictures of pretty people, but somehow, this shot tells me just as much . 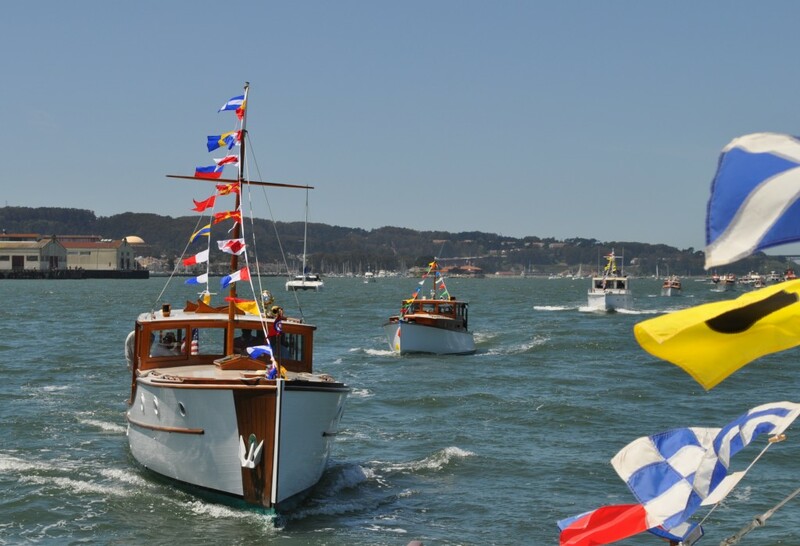 . .
All too soon we were pulling into Pat Pending‘s longtime berth at the San Francisco Yacht Club, Belvedere, and what’s up with this? 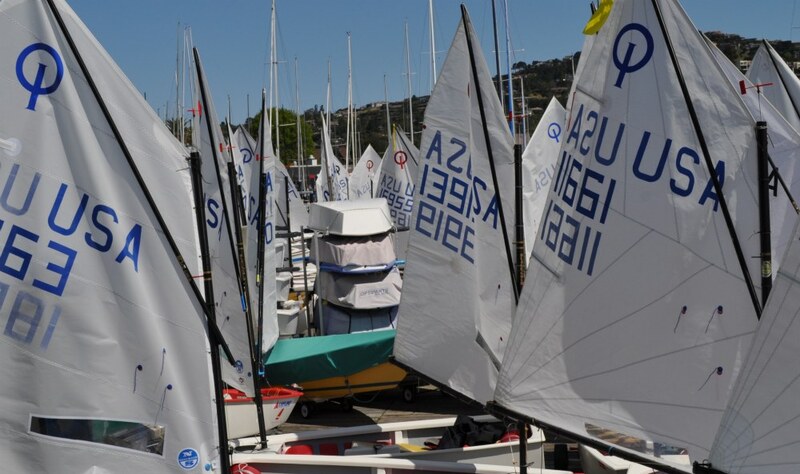 Oh, it’s the Opti Team Trials, and the Optis are everywhere. All week . . .